We changed our rundown, or lineup of stories, several times as we prepared Thursday's program. 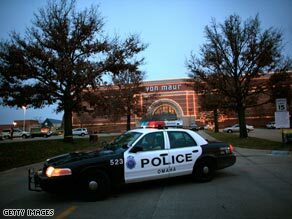 As details emerged from the tragic shooting at a mall in Omaha, Nebraska, that story quickly rose to the top of the show. Considering malls are a quintessential teenage hang-out, if this incident happened on a weekend or after school, it could have been much worse. We always consider how such a story will play out in class when we put the show together, and hope you'll use our questions to help guide the discussion about this story. Let us know how it went. PLEASE STOP showing the picture and name of these people all over the news. This kid said he wanted to out in a blaze of glory. Don't give the blaze of glory and they won't take numerous innocent people with them. Where else in the world besides the US do you see these acts of violence so regularly. No where, because no where else plasters the name and photo on every newspaper cover and TV channel for the next week. I live in Stratton, Nebraska. This makes the Omaha shooting hit closer to home. It makes me think that maby a shooting could happen at my school. Even though i know that most of the people that i go to school with are mostly sain, it still feels that it is possible. I must also say that if you even suspect someone of doing something like this it's important to tell someone. i think that the shooting in omaha was a bad thing. if the kid wanted to go out in style idk why he had to take 8 people with him. most of the people that were in the place got lucky to get out alive. i feel sorry for the familys that lost someone to the shooting. THATS NOT COOL only a complete idiot would kill someone if they got fired from MC DONALDS not to smart .right? mcdonalds isn't the best job to have not trying to be ileadist. he is not the kind of person you want to have flippin burgers any way. Question. Whay did the person start shooting people? Was it just holiday shopping traffic in the stores or something? People need to stay calm. How would they feel if their family got hurt? I would hate it if anything happened to my friends or family! This is what happens when guns are banned. Banning guns only gives a shooter like this individual more time to KILL more people. I hope some people have learned a lesson from the Church shooting. If it were not for one person having a gun on her person several hundred people would be dead and/or wounded right now. As it stands only 4 people were killed and that was because the shooter was killed BEFORE he could kill anyone else. What is up with all of the shootings going on one just happened like yesterday people need to settle down a little. Like today i think that some guys shot like six little kids at a bus stop. These thing are just sad. Just think of yourself being the kids who got shot. When you hear about horrible incidents like this you always feel bad for the people that it happens too. I know living in a small town I think that it could never happen here but it can. I live in Nebraska and even though Omaha is about 250 miles away it seems like the tragedies are getting closer and closer to home! I think it's a horrible thing that happened at the mall. If this guy wanted to kill himself then why did he have to bring other people into it as well? If your life is so bad and you think you'd be better off dead then that's your choice but don't bring other innocent people into it! wowzers! this is one messed up kid. all because he lost his job at McDonalds, and him and his girl fried broke up? i mean was it really worth it? break ups happen. losing your job happens. it's all part of life. but he had to go to the extream and kill inocent people. this whole thing is twisted and unnecessary. this just shows how stupid people can be in poor judment. This news just saddens me. To think that innocent lives were taken, for absolutely no reason at all. And worse yet, it happened in a very public place, a regular place where people are every single day. It just gets to me that there are people in this world that are that sick in the mind, that they would end lives so quickly for absolutely no reason at all. I am so sorry for the people affected by this tragedy, and my prayers go out to them. With the world as it is today, and such events happening, it makes us wonder if we're ever really safe? I just can't believe that things like this are actually going on, I can't believe that people would do this, kill people and then take their own lives, and I just have to pray that less tragedies like this wll occur. That is just sad, that someone would go to a place where innocent people are shopping and shoot at them. If someone is so mad that they feel like they have to go an kill innocent people something is clearly not right in their mind. I mean, why would someone even think about doing something like that. Yes, he was going through a hard time, but guess what? Things usually do get better or people can make them better. He should have just gotten help or something. No one goes out and shoots people. Some people in this country some people in this country think that other people are the reason that they are depressed. It is just wrong for someone to go out and shoot other people because of something that happend to them. Alot of people died that day. They didnt do anything to deserve it either. If malls would be somewhere that teenagers would go after school, and a shooting happend there, it wouldnt be good. No one should have to go through that. When I heard about the shooting I thought, if your life is soooooooo bad then why do you go out and kill innocent people? Then I thought to myself they do it for fame. They go out and kill peple kill themsef and then get on the news! When you put stuff on the news like that then you are just giving them what they want. I do see why this should be on the news but then I also see where it shouldn,t. Like I said you are just giving the person what they want. To me thats not the best thing to do for a person who is a killer! May all the families who lost their family members have the best holiday that they can have and may all the people who got killed RIP. This story really hit me because I used to live in Omaha a few years ago and to hear about this shooting really kind of scared me. Because my family and I used to go to Omaha Mall alot, it was really fun and now to think about this, I realize, that could have been me. This is a sick story because of the killer. Why would someone want to shoot up a mall? He must have been pyscho because thats just sick, reckless and stupid.